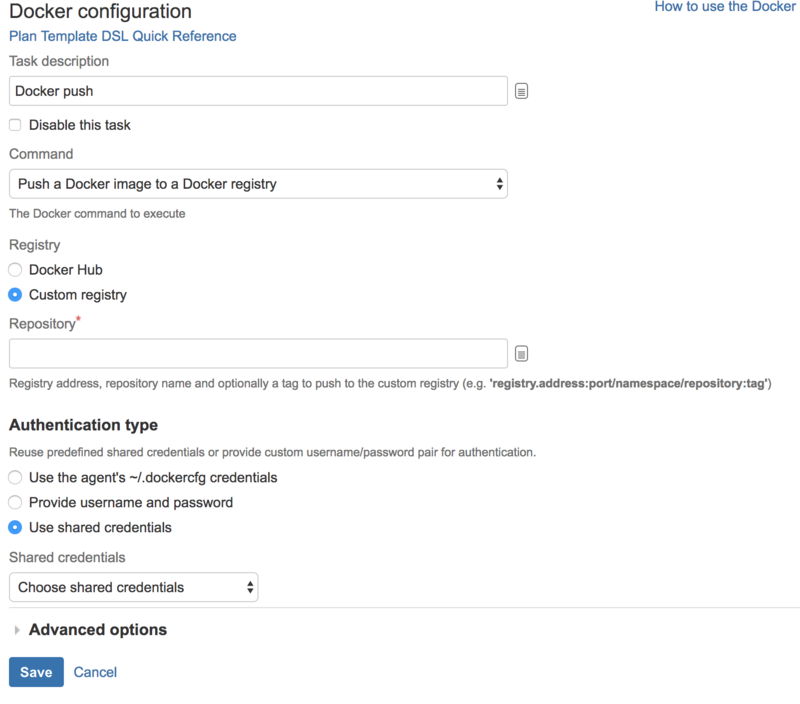 The Docker task in Atlassian Bamboo allows you to use Docker images and containers in your Bamboo builds and deployments. Make sure you have Docker installed. We advise to use the most recent version. If you're using Bamboo on Windows, you can't run Docker commands directly from the Windows command line. To use Docker tasks with Bamboo Windows, run Docker Machine. 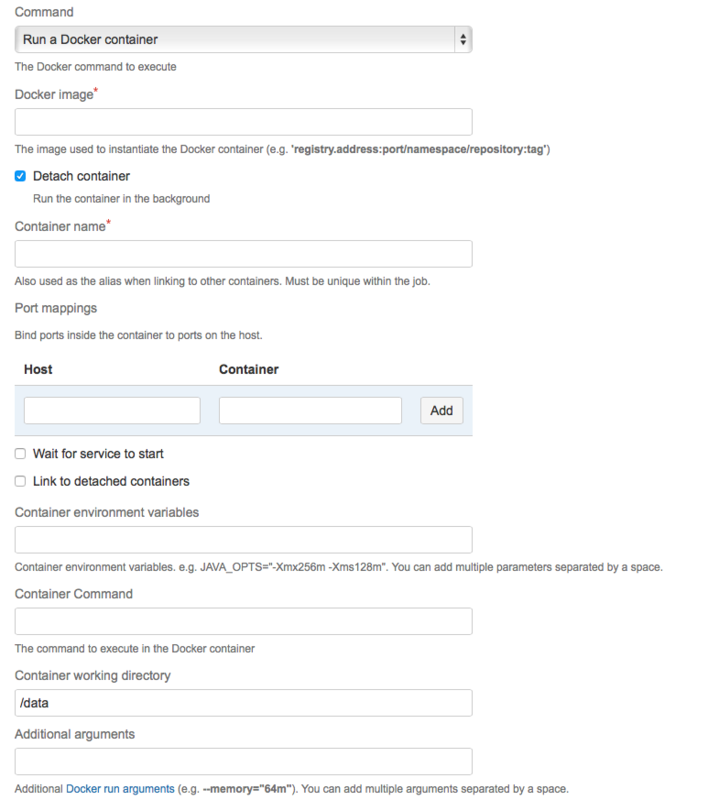 Builds a Docker image based on the specified Dockerfile. 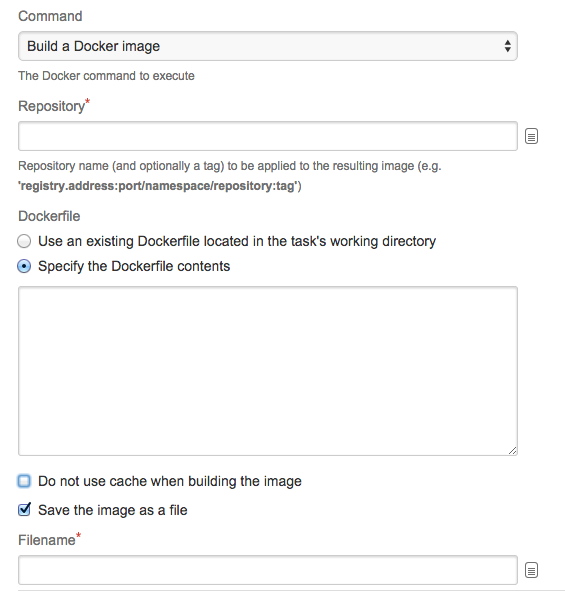 The Dockerfile may be provided as an existing file in the task's working directory or defined in the task configuration.The image is stored in Docker's local image installation directory and can be used by subsequent Docker tasks in the job. You can optionally save the image to a file in the working directory which can then be packaged as a build artifact. Create a new Docker task for the relevant job. See Configuring tasks. By default, Docker will reuse a cached build during the next build. See the Docker documentation. Select Do not use cache... to ensure that the new image will include changes since the last build. Note that this may incur a performance penalty. Specify the directory location and file name. Optionally configure a a job artifact to pass it to next stages and deployments. By default, the task's working directory is mounted and used as the Docker container's working directory, but you can specify your own settings. By default, the container is removed on completion of the task, but you can choose Detach container to have the container continue to run after a deployment project completes. Containers can be linked to detached containers started by preceding tasks in a job by selecting the 'Link to detached containers' option. Note that a non-detached container that fails to start will not be removed when the Bamboo task completes. See this KB article for more details. Specify a Container name that isn't used by other containers in this job. Click Add port mapping to specify mappings that bind ports inside the container to ports on the host. Allows you to specify parameters to pass to the container, for example JAVA_OPTS="-Xmx256m -Xms128m". The working directory for the container.
" --health-cmd=mysqladmin ping || exit 1"
You can mount additional host directories as data volumes inside the container. (Optional) Additional system environment variables that you want to pass to your build. Note that existing environment variables are automatically available to the executable. You can also include Bamboo global or build-specific variables (see Bamboo variables). Multiple variables should be separated with spaces. Parameters with spaces must be quoted (e.g JAVA_OPTS="-Xms200m -Xmx700m"). (Optional) An alternative subdirectory, relative to the job's root directory, where Bamboo will run the executable. The root directory contains everything checked out from the job's configured source repository. If you leave this field blank, Bamboo will look for build files in the root directory. This option is useful if your task has a build script in a subdirectory and the executable needs to be run from within that subdirectory. Docker command updates ~/.dockercfg file; if you have any configuration management tool in place updating this file (like puppet, chef or ansible), make sure it's not executing while you are running a docker build. Docker stores it's images in a local image installation directory. Over time this directory may grow to consume all of the available disk space. When this occurs you should remove unused images by running the docker rmi command. error    12-Feb-2015 12:12:14    Error occurred while running Task 'Build docker image(5)' of type com.atlassian.bamboo.plugins.bamboo-docker-plugin:task.docker.cli.